In this tutorial, you configure a CloudWatch Events event rule that captures events when a job status changes to ERROR and then notifies you about the event. To do this, you first create a topic in Amazon SNS that will send you an email notification about the failed job. 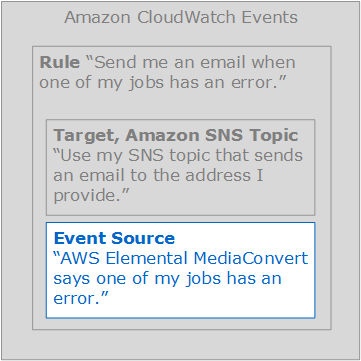 Next, you create a rule in CloudWatch Events by defining an event source and referencing the Amazon SNS topic (the "target"), as shown in the following illustration. This tutorial assumes that you already know how to create AWS Elemental MediaConvert transcoding jobs. For information about creating jobs, see Setting Up a Job in AWS Elemental MediaConvert. At the end of this tutorial, you can submit a job that you designed to fail, to test that you configured your Amazon SNS email notifications correctly. The first part of setting up a CloudWatch Events rule is preparing the rule target. In this case, that means creating and subscribing to an Amazon SNS topic. In the navigation pane, choose Topics, and then choose Create new topic. For Topic name, enter MediaConvertJobErrorAlert, and then choose Create topic. Choose the topic ARN link for the topic that you just created. It looks something like this: arn:aws:sns:region:123456789012:MediaConvertJobErrorAlert. On the Topic details: MediaConvertJobErrorAlert page, in the Subscriptions section, choose Create subscription. For Protocol, choose Email. For Endpoint, enter the email address that you want Amazon SNS to send the notification to. You will receive a notification email from Amazon SNS. When you receive it, choose the Confirm subscription link in the email. Next, specify your event source in a CloudWatch Events rule to capture only events that are generated by a job status that changes to ERROR. In the navigation pane, choose Events, and then choose Create rule. In the Event Source section, choose Event Pattern, and then choose the element labeled Build event pattern to match events by service. From the resulting dropdown list, choose Custom event pattern. This code defines a CloudWatch Events event rule that matches any event where the job status changes to ERROR. 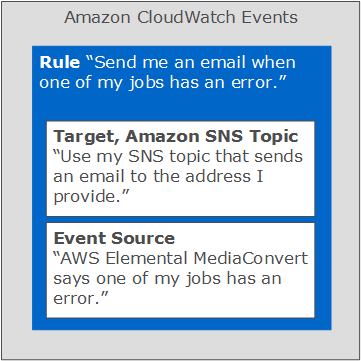 For more information about event patterns, see Events and Event Patterns in the Amazon CloudWatch User Guide. 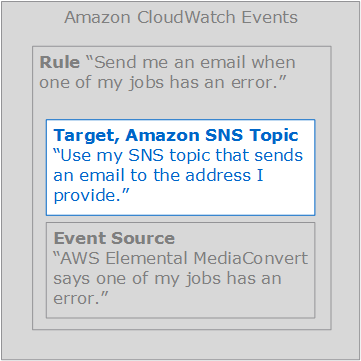 Next, add the target (the Amazon SNS topic) that you created in step 1 to the CloudWatch Events rule that you started in step 2. In the Targets section, choose Add targets, and then change the default Lambda function to SNS topic. Choose the Configure details button. For Rule definition, enter a name and description for your rule, and then choose Create rule. To test your rule, submit a job that you know will cause an error. For example, specify an input location that does not exist. If you configured your event rule correctly, you should receive an email with the event text message in a few minutes. Submit a new MediaConvert job. For more information, see Setting Up a Job in AWS Elemental MediaConvert. Check the email account that you specified when you set up your Amazon SNS topic. Confirm that you received an email notification for the job error.